I likened them to teens and part of the family. Both abandoned and rejected by their parents. Some of their siblings were accepted while they were left to fend for themselves. Popcorn whom we received at 4 weeks of age was so hungry. Like a teenager, they are hungry too, but for love. Popcorn practically fell over by all the sniffing her new big brothers (our two dogs) were giving her and that was their way of accepting her. As parents and siblings, we often show love by affection but some teens are not always ready to accept that affection. Although we loved and adored and played with Popcorn, her personality is distant and only comes to you in her time of need. Some teens have a beginning that has been founded by abandonment and rejection and they find it very difficult to respond in the same manner we give. Sometimes that attachment is broken and they don’t have a comprehension of why they feel that way or even how to respond in a normal way that most people do. It is foreign and uncomfortable to them. Popcorn knows we love her. We praise her with treats and give her extra attention and petting to let her know how much we love her and also to break down that attachment disorder that she still has. Even with teens, those who have come from very difficult circumstances react and cope through other means that are different from others. It doesn’t mean that it is wrong but another way of dealing with their emotions and affection. We will always love Popcorn, even if she can’t love us the same way back. 3D came to us differently. We have a neighbor who is 88 years old. She is a sweet lady but often forgets things such as feeding an animal or loses things constantly. Her house is so messy and full but I must admit, she is a very clean hoarder in that her kitchen and bathroom are mopped and cleanliness is important to her. When she was hospitalized and had to go to rehab, she had 3D living with her. He was one of many cats but most of them lived outside leaving him as the only inside cat. I told my neighbor that I would take him in. Fleas infested all over him, he was skin and bones from starvation, skittish, confused, unaffectionate and didn’t like to be held. How many teens have we come across that were distant, confused, didn’t want to be touched, didn’t trust you or sickly? How do we reach out and touch the inner heart of what is happening to them but in a safe distance to build their trust? It takes time. It is not an overnight treatment. The first thing I did was feed the poor guy as much as he wanted and never took anything away. I wanted him to know what was mine was his, he didn’t need to ask (or cry) for more. I gave him some space and not crowd him or watch his every move. For a teen, providing the basic essentials can often be a lot. When I was first married, my husband and I took a teen girl in from an abusive situation. I was shocked when she asked me if she could “borrow” some toilet paper from the bathroom. I had never heard of someone who needed to ask to use toilet paper. But obviously whatever happened in her home caused her to to be afraid to take some on her own. She finally can laugh about it now, but was so afraid at the time of how we would respond to her request. Giving space is important too. It gives them time to rest, to calm down, to feel safe which was necessary for 3D. That includes not having visitors as well. Too much too soon is never a positive thing. Think of their needs. We continued to pour affection. Small bits of it. Too much is an overload for teens emotionally. Always ask permission when you want to show affection such as a hug. It’s important that they learn that they are allowed to have boundaries and it also teaches them to respect each other. Men would often say hello and give me a hug, but to a young girl who has had some very bad experiences with men in her life would be disastrous. Let them have that control. Remember, most teens who has gone through crisis after crisis often did not have control. Asking the teen what they are and are not comfortable with is important in that bonding process. Again, this is building trust between each other when you can talk about it and work on building that relationship. I would often talk to 3D softly and gently. He would soon recognize my voice and also calm down when I was calm. Even with teens who have suffered some traumatic circumstances in their life can relate to you even more when you can talk to them in that calming tone. Yelling doesn’t get anyone anywhere. It just causes stress all the way around. When 3D seemed to be upset I would often put him in a room and have him do some quiet time. It wasn’t a punishment, but when you read on animal psychology, you find that animals stress level comes down when they have a safe isolated area to just breathe, rest, and de-stress. Teens often need that privacy and security to just de-stress when they feel that anxiety come upon them. Soon 3D became stronger in physical and mental strength. We continue verbal affirmation, structure and supplying his needs. He is really no different than a teen. Continue to praise them with that same affirmation, giving them structure and discipline (be careful how you discipline which I will discuss in another blog), and most importantly, pray for them and with them. It’s imperative that they understand that they weren’t just someone you invited into their home, but someone who you value and God values. Let them know they are very much wanted and how much of a blessing they are in your life. I can tell you now that Popcorn and 3D are doing great. 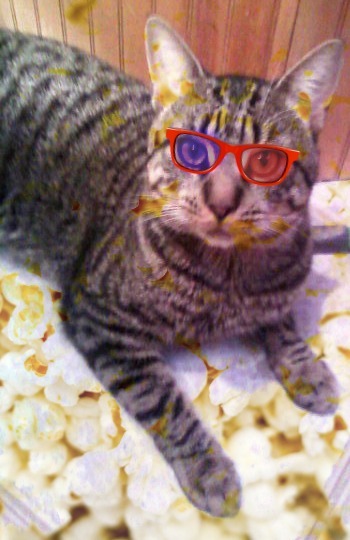 Popcorn is the Diva queen in the house and 3D is the Man cat of the house. His behavior has changed dramatically. I can now hold him (for short periods) and pet him for long periods of time. When he wants me he cries for me, and for the first time in a year, he actually jumped up in my bed and laid down next to me and went to sleep. This entry was posted in Adoption, Attachment Disorder, Identity Crisis, Teens In Crisis and tagged abandonment, Attachment disorder, parenting foster children, rejection, support and help for troubled teens, Teens in Crisis. Bookmark the permalink.